Kitchen countertops are one of the most frequently-used parts of our home. We spend a considerable amount of time in the kitchen preparing and cooking food for ourselves and our family. It’s no surprise, then, that these furnishings suffer from the most wear-and-tear; reflected in scratches, abrasions, and even stains after years of exposure to food, water, and acids. It is only by using a top-notch sealer that will effectively protect your countertop from damage while ensuring that it looks great. Investing in a good-quality sealer will ensure your investment will last a lifetime, so you don’t have to worry about the expenses and hassles involved with having to replace it. This is why it’s so important to be critical when choosing a countertop sealer. There are many in the market that work exactly the same, but not all of them are non-toxic and safe for food. It also helps when you choose a product that has been made by a reputable brand. You need a countertop sealer that works hard to protect your countertop from the inside out. One that penetrates deep within to add extra durability and strength, and one that leaves a thin but hard and effective protective shell outside to prevent stains and discoloration. 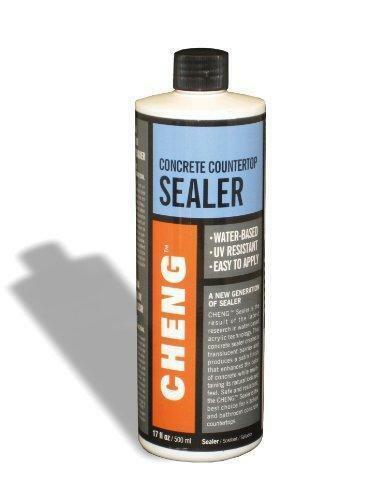 Look no further than the Cheng Concrete Countertop Sealer to do the trick. Considering how well it works in keeping your porous concrete countertop clean, safe from germs, and looking pristine, there’s no need to think twice about this product. You can even use it on outdoor projects, furniture, sinks, and fireplaces because its superior formula has made sure that it remains versatile while being high-quality. Speaking of formula, it contains no VOCs and toxins. It’s water-based and completely food safe. The four-liter bottle can cover 240 up to 400 square feet of concrete, ensuring that it will last you a long time, helping you maintain the integrity not just of concrete countertops but other important surfaces in your home. It will leave a lustrous finish that isn’t too glossy nor matte. After applying a few layers on your countertop, it goes deep to protect it from inside. You’ll soon notice that it also leaves a thin but hard shell that protects your countertop from chipping, etching, stains, and wear and tear. Because of this, you can confidently use your concrete countertops exactly as it was intended without worry that water will seep in. Homeowners looking for a food-safe solution for their countertops, look no further than the Cheng Concrete Countertop Sealer. It can be difficult enough to keep your kitchen clean without having to worry about the hassles of working with a complex product. The good news is that the Cheng Concrete Countertop Sealer is very easy to use. It only requires you to work in an area that has still air, since a breezy environment may cause it to dry prematurely. With a few supplies such as clean rags, protective clothing, rubber gloves, and a bucket, working with this product is simple! Before working with it, gently rinse the entire surface using a clean rag. Avoid scrubbing because small grit particles may cause scratches on its surface. However, all kinds of dust and dirt should be rinsed off. Then, mix it with equal parts water to create a 50% dilution. Using a clean rag, cover the entire countertop with the dilution and leave the surface wet for five minutes. This process is repeated two times, before finally wiping it down. All the instructions you need to use this product well are indicated on the package. It also needs to be protected from freezing, but other than that it’s so simple to keep and use. Users all over the country love this product because its safety, durability, and efficacy has been tried and tested. It doesn’t hurt either that it’s been manufactured by a trusted name in sealants. Customer reviews reveal how happy people are with Cheng Concrete Countertop Sealer. They are happy with the ease of application, and it leaves your concrete countertops looking great. Although the manufacturers recommend finishing it off with a wax, many people have found that the finish comes out so well that this last step isn’t even needed. This translates to even more savings for homeowners. If you are a homeowner who needs a durable, reliable, and effective concrete sealant, the Cheng Concrete Countertop Sealer is the only solution you’ll need. It is well-known for providing long-lasting results with a great-looking finish, so you’ll never have to sacrifice aesthetics for durability. One investment in a good quality sealer will save you money from repair and renovation, while giving you the peace of mind that you are using a non-toxic product that is also food-safe. There is no doubt that it’s a superior product when it comes to efficacy, performance, and affordability. It has received many five-star reviews on Amazon because customers are just so satisfied with it. The perfect sealant does exist; it’s Cheng Concrete Countertop Sealer. Don’t be one of those homeowners who waits until the last minute to do costly repairs with their countertops. Be proactive by giving your countertops the protection it needs from the start. Count on Cheng Concrete Countertop Sealer to do the job, without the hassles and costs involved with hiring other people to do the work for you. This one-time investment will be the most important one you can make, because it will save you from spending hundreds of dollars in the future from repairs. It will do wonders for your countertops, and even concrete surfaces outside your home, your fireplace, and furniture.